SIPTU has called for extra pay or compensation for local authority employees who work during extreme weather events in line with what has recently been promised to workers in the health sector. 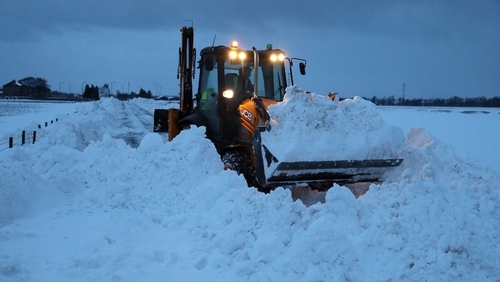 Last week, the Health Service Executive said that staff who worked during the Storm Emma red alert would be given two days additional annual leave, while those who could not make it in would be paid as normal. At the time of the decision to award the extra annual leave, the HSE had not yet calculated how many staff would be entitled to the extra leave, and how much it might cost including the requirement to hire agency workers to replace staff taking that additional leave. It is also understood that the decision was taken internally by the HSE, without reference to the Department of Public Expenditure and Reform, which holds overall responsibility for public service pay policy. However, observers had already voiced concerns that the HSE concession could trigger knock-on claims from other public servants who worked during the severe weather. Today, SIPTU Sector Organiser Brendan O'Brien called for a protocol for a uniform response by local authorities to extreme weather events, including what he called "...proper remuneration for those who work extra days and hours during such crises, as has been agreed with workers in the health service over recent days". Mr O'Brien noted that local authority staff had worked tirelessly during Storm Emma to clear roadways and other public services, and were also currently engaged in emergency repairs to damaged water infrastructure. He also cited members in the fire services who had maintained a full fire, ambulance and rescue service during the red alert period. Mr O’Brien urged the Minister for Housing, Planning and Local Government to ensure that local authorities were properly resourced and staffed to respond to future weather events, as well as an agreed protocol as to how staff will be remunerated for extra work involved - as well as for those who were unable to attend their employment due to adverse weather.